In a large bowl, add the Alfredo sauce, drained tomatoes, spinach, 1 cup of the mozzarella cheese, basil, crushed red pepper, and a few shakes of salt. Stir together with a rubber spatula. Add the uncooked tortellini and use the spatula to break them apart. Stir it all together so that each tortellini is covered in sauce. 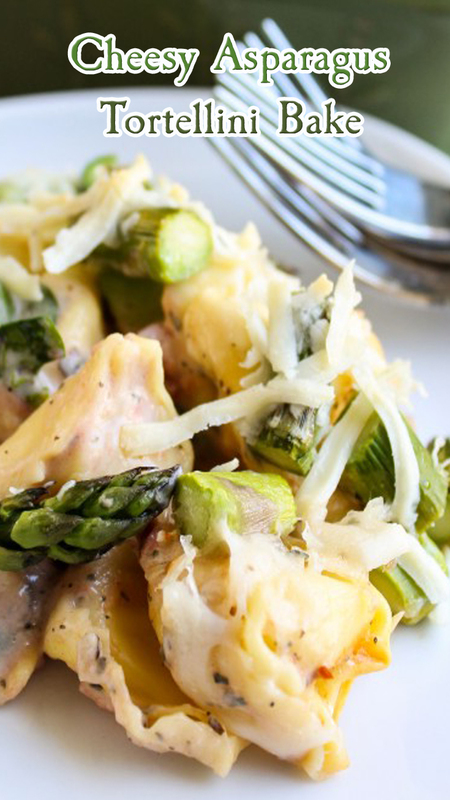 Layer the asparagus on top of the tortellini. Sprinkle another 1 cup of mozzarella over the top, then sprinkle the 1/4 cup Parmesan. Bake in the middle rack of the preheated oven for about 30 minutes. If the edges are looking brown but the cheese in the center isn't browning, broil it for 1 minute.